Given that there is a growing understanding of the local impacts of climate change, as well as the impacts of climate change on extreme weather events like the current hurricane season in the United States and Caribbean, the need for innovative and strategic resiliency and adaptation planning and investments is greater than ever. 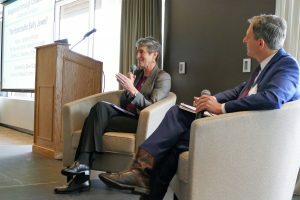 For this Inaugural Climate Adaptation Forum, the Honorable Sally Jewell, former U.S. Secretary of the Interior, will participate in a conversation focused on adaptation and resilience. The Forum then continues with three speakers presenting their active adaptation programs and actions, ranging in region from Florida to New York City to Coastal Virginia. These three speakers have specifically been selected to provide an opportunity for Boston-based climate practitioners to learn from experts in locations that have already been forced to face climate disruptions. Finally, there will be a panel discussion moderated by Austin Blackmon, the City of Boston’s Chief of Energy, Environment, and Open Space.